Science After Retirement: What Causes Short-term Variability in Soil Moisture? What Causes Short-term Variability in Soil Moisture? On June 8, 2017, Ryan, Sandra, and I completed installation of a weather station and four soil moisture monitoring platforms in the PUSH neighborhood of Buffalo for the Vacant to Vibrant Project. With all of the monitoring platforms now in place for the project, we need to have quantitative methods with which to analyze the data. The goal of the analysis methods is to measure the storage and processing capacity of the green infrastructure installed in the experimental parcels of the three cities in the project. As documented in a previous post (here), experimental and control plots display patterns of variability in soil moisture at various time scales. 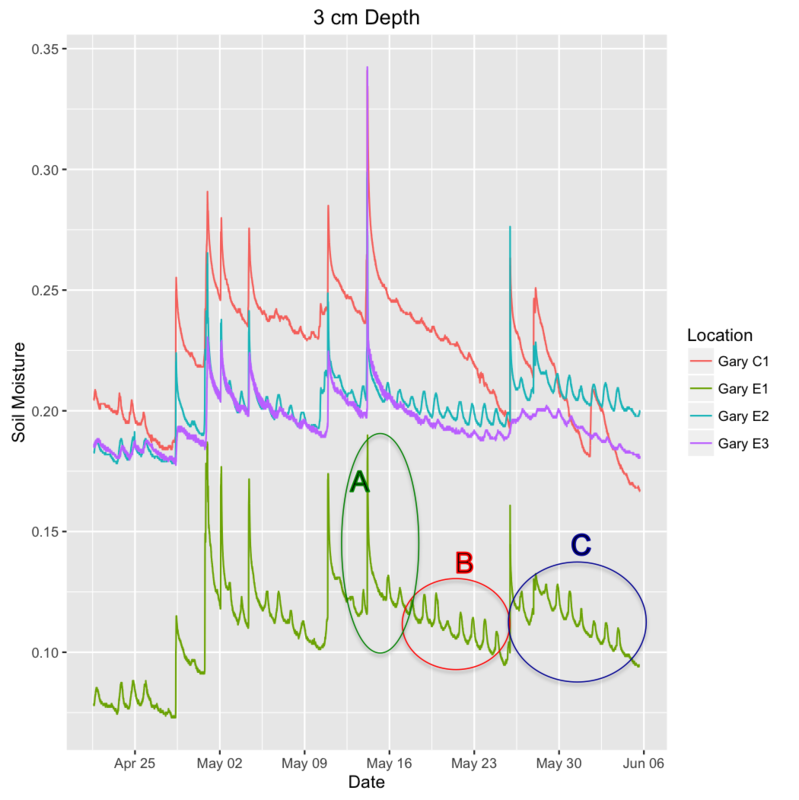 Figure 1 illustrates the types of variability patterns observed in soil moisture at four of the sites in Gary’s Aetna neighborhood. Basically, there are three types of variability in Figure 1. Rainfall events have an abrupt increase in soil moisture followed by a rapid decline (see selection A in Figure 1). Between rainfall events there is a slower decline in soil moisture (see selection B in Figure 1) with a pattern of regular short-term variability (see selection C in Figure 1). This blog post focuses on finding the drivers of short-term variability. Figure 1. 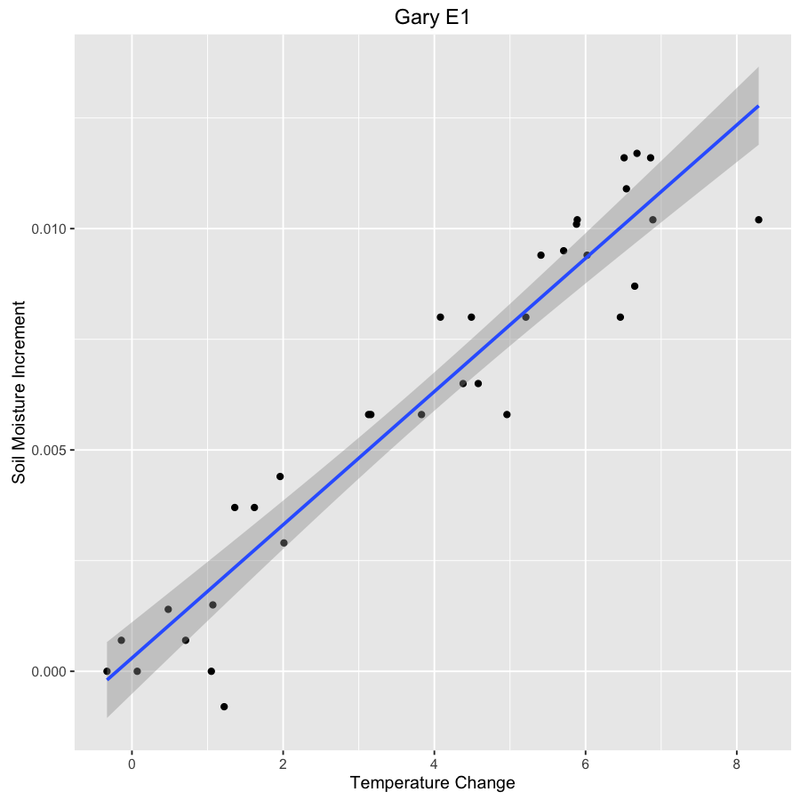 Variation in soil moisture at 3 cm depth in four study sites in the Aetna neighborhood of Gary. Parcels are as follows: 1200 Oklahoma (Gary E1), 1035 Oklahoma (Gary E2), 1252 Dakota (Gary E3), and 910 Idaho (Gary C1). The emphasized patterns include: A—changes associated with rainfall events, B—steady decline during rain free intervals, and C—short-term variability in the decline time series between rain events. The regular pattern of short-term variability appears to be diurnal. 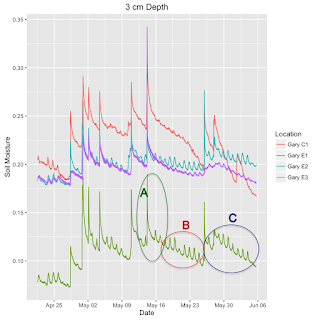 Figure 2 shows an expanded view of the decline during the May 28 to June 6 interval in Figure 1, selection C. The diurnal patterns of soil moisture variability and temperature are synchronous. An obvious hypothesis is that these short-term changes in soil moisture are driven by temperature changes. Figure 2. Comparison of patterns of change in soil moisture and temperature over the interval of May 26 to June 6 at 3 cm in the Gary E1 site. If temperature changes are driving short-term variability of soil moisture, there should be both theoretical and experimental evidence to support the claim. From a theoretical perspective, there is ample evidence indicating that soil moisture measurements are temperature sensitive. The soil moisture probes that we use (Onset Part No. S-SMx-M005) use time domain reflectometry (TDR) method to estimate volumetric water content. It is well known that temperature dependence of TDR includes both instrumental and physical effects (Or and Wraith, 1999), and there are methods of correcting for instrumental sensitivity to temperature change (e.g. Chanzy et al., 2012). Because the physical effects of temperature on soil moisture reflects the underlying influence of temperature on the bound to free ratio of soil moisture, soil composition and soil moisture content interact with temperature effects to limit the generality of correction methods (Seyfried and Grant, 2007). Nevertheless, diurnal variability of soil moisture with temperature changes is an expected pattern. Figure 3. Histogram of soil moisture (SM, m3/m3) for the Gary E1 time series in Figure 1. 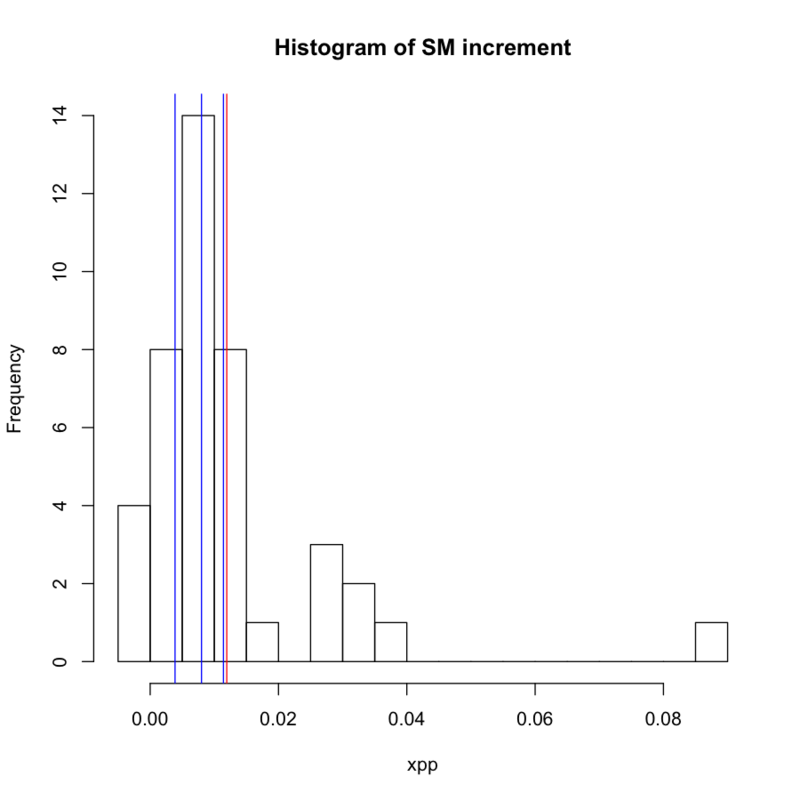 The red vertical line is the mean increment, 0.012, and the blue vertical lines are the quartiles. The distribution in Figure 3 is skewed with the mean near the third quartile. Using the mean as a demarcation of diurnal soil moisture increments from rainfall event increments, Figure 4 shows a very strong linear dependence of soil moisture increment on temperature change. 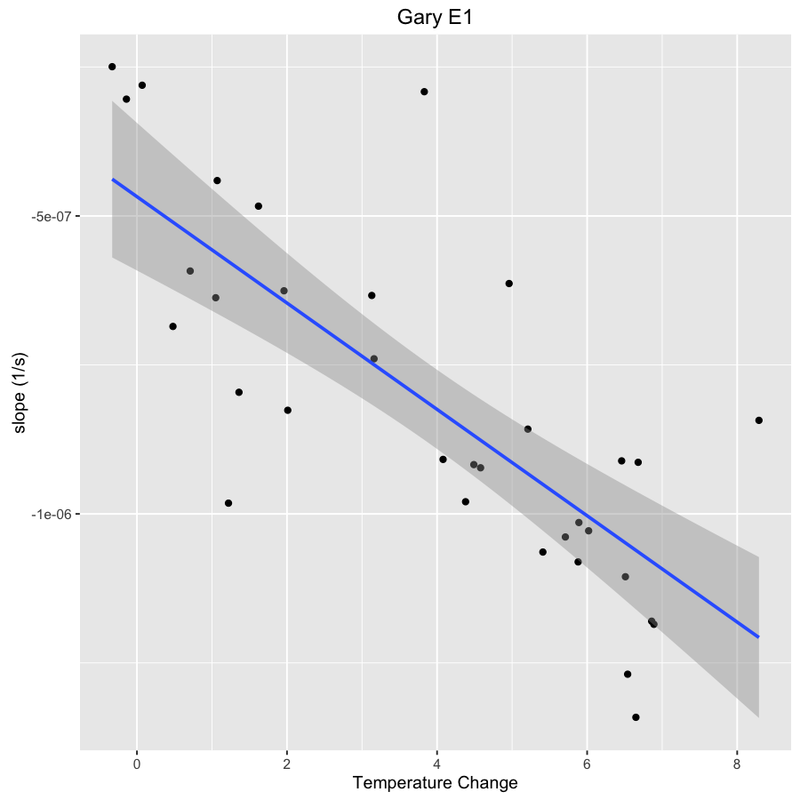 Figure 5 provides evidence that the subsequent decline rate also depends on temperature change. Figure 4. Association of soil moisture increment and temperature change for soil moisture increments less than 0.012. In blue, is the regression line (r=0.95, p<0.0001). The shaded area represents the standard error bounds. Figure 5. Association between temperature change and the instantaneous slope of the decline in soil moisture for increments of soil moisture less than 0.012. 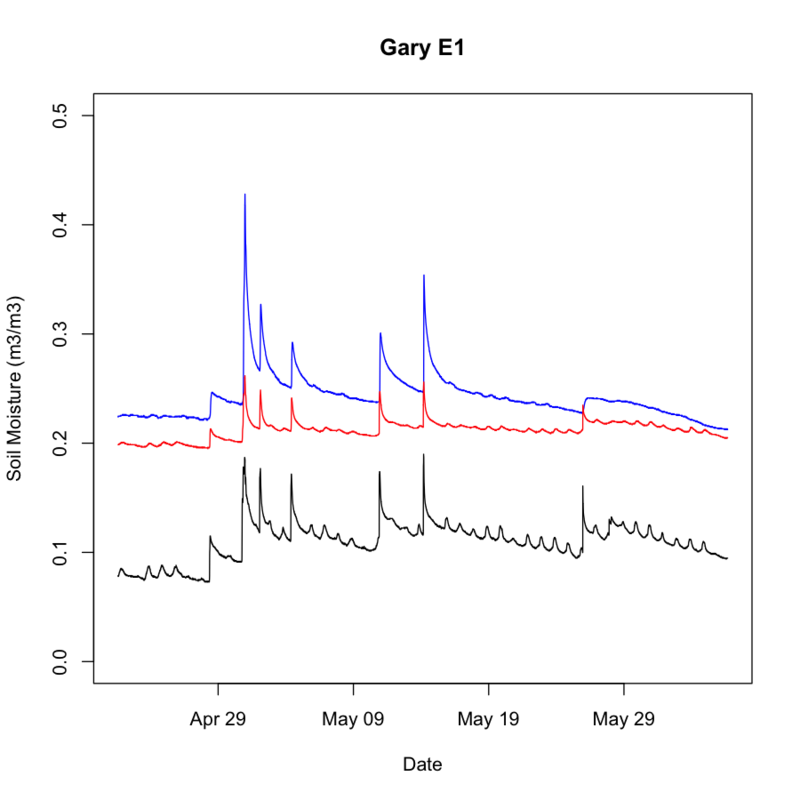 In blue, is the regression line (r=0.77, p<0.0001). The shaded area represents the standard error bounds. As noted by Or and Wraith (1999), separation temperature-dependent variation of soil moisture from changes associated with evapotranspiration and soil infiltration is necessary to understand the contributions of evapotranspiration and infiltration in individual experimental and control parcels of the V to V project. Although there are proposed methods for removal of temperature-dependent transients, their lack general reliability across types of soils and range of soil moisture conditions is a limitation (Seyfried and Grant, 2007). Furthermore, as shown in Figure 6, the diurnal pattern of variability varies with depth, reflecting both attenuation and phase shift of temperature variation. Even with temperature correction, diurnal fluctuation of soil moisture associated with temperature dependent release of bound soil moisture will remain in the time series. Given the regularity of the diurnal variation of soil moisture, a smoothing technique may offer a satisfactory method to estimate rates of decline during longer event free intervals. Figure 6. 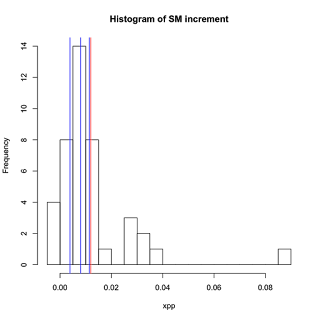 Comparison of soil moisture variability in Gary E1 for three soil depths (3 cm, bottom black line; 10 cm, middle red line; and 20 cm, top blue line). Chanzy, André, Gaudu, Jean-Claude, and Marloie, Olivier. 2012. Correcting the Temperature Influence on Soil Capacitance Sensors Using Diurnal Temperature and Water Content Cycles. Sensors, 12, 9773-9790. Or, Dani, and Wraith, Jon M. 1999. Temperature effects on soil bulk dielectric permittivity measured by time domain reflectometry: A physical model. Water Res. Research, 35(2): 371-383. Seyfried, Mark S. and Grant, Laura E. 2007. 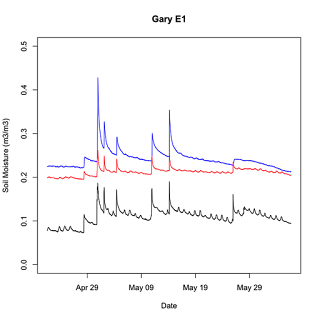 Temperature Effects on Soil Dielectric Properties Measured at 50 MHz. Vadose Zone J. 6:759–765.